Those Harry Potter fans who weren't able to secure tickets to the highly anticipated stage-set sequel of J.K. Rowling's beloved series may still be able to see the two-part Harry Potter and the Cursed Child. The West End production will be conducting a ticket lottery online every Friday, offering great seats for both parts of the play (in two consecutive performances) for relatively cheap cost. They're calling it "The Friday Forty," because -- starting Friday, June 3 at 1 p.m. (presumably London time) -- 40 tickets for every performance for the upcoming week will go on sale every Friday afternoon. These are said to be good seats, and the cost is relatively low, with preview show (June 7 - July 3) tickets going for £30 (£15 per part), and official opening tickets going for £40 (£20 per part). There's a limit of two tickets for both Part 1 and 2 per transaction. For those on U.S. currency, at the current exchange rate, £30 is about $43 and change. £40 is about $58. Those really aren't bad prices when you consider that they're said to be good seats, and you're getting two plays. If there's a downside to this situation, it's that the only way to participate in The Friday Forty lottery is online (at HarryPotterThePlay.com). While that might seem like a massive convenience to those who aren't within commutable distance to the Palace Theatre in London, it does mean that you'll be up against the rest of the internet on any given Friday when the tickets become available. So start brewing your felix felicis and be prepared to make quick plans to get to London if you do manage to lock down some seats. In terms of how the lottery will work, from what the official Harry Potter and the Cursed Child site says, it really does sound like it'll come down to luck, as those who click the "book tickets" button at 1:00 p.m. on Friday will be sent into a virtual queue, where they'll hope to be among the randomly selected people given the opportunity to purchase tickets online for the next week's performances. The site also notes that you may be able to get last-minute tickets at the Palace Theatre, but those will be at full price. And we're guessing the seats won't be as good as the lottery seats, though that might vary. In my experience with Broadway shows, lottery seats are typically pretty fantastic. Harry Potter and the Cursed Child's site doesn't specify where the Friday Forty seats will be located, but they do promise "some of the very best seats in the theatre." So it sounds like this situation will be well worth the price and the anxiety. Written by Jack Thorne, with J.K. Rowling and John Tiffany, Harry Potter and the Cursed Child is officially the eighth story in the Harry Potter series, and will follow Harry Potter as he "grapples with a past that refuses to stay where it belongs," while his son Albus tries to handle the weight of his unwanted family legacy. 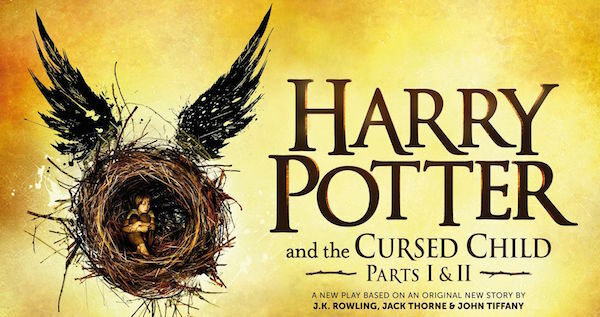 Watch the preview video for Harry Potter and the Cursed Child here.